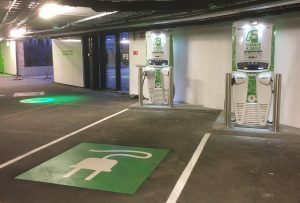 Vulkan is one of the largest and most advanced EV charging garages in Norway and Europe. With over 100 EV chargers, quick chargers and additional battery storages for smart charging, Vulkan is an embodiment of the expected fusion between building, energy and transport sectors. The City of Oslo wants to have more than 200.000 electric vehicles on its streets by 2020. In order to reach this ambitious environmental goal, Oslo needs to make sure that everybody can charge their electric vehicle, both private and professional users of electric vehicles. A fusion between the building- and transportation sector is needed. The innovative parking garage Vulkan, serves both residents and companies. During the day, Vukan operates as a ‘Centre of excellence’ for professional users of EVs as E-taxis, electric freight vehicles and EVs for craft & services. It provides opportunities for pre-booking of charging time, flexible charging, battery storage, and quick charging. 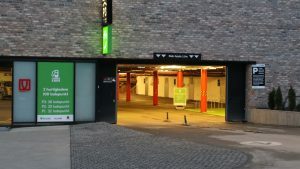 At night, Vulkan offers free residential parking for people living in the neighbourhood. Besides the different day and night users, Vulkan is also a hub for EVs that use overnight charging at home, in combination with (semi-)quick charging during the day. This creates a flexible and cost-efficient site for the promotion of EVs. More than 400 EVs are served on a daily basis. The turnover in terms of kWh per week has tripled since the opening in February 2017. The smart grid system at the site, shaves 20% electricity consumption during peak hours. The pilot already created a reduction of 8 tons CO2 emissions in 2017. New professional users of EVs e.g. 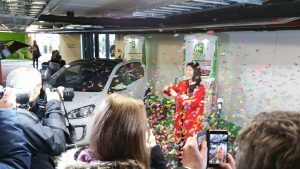 car sharing, cleaning company and craft and service vehicles, have started their operation from the site with very positive feedback. The next stage will be to include next generations super quick charges, using second-life batteries for shaving the peak and installing V2G, AC and DC.